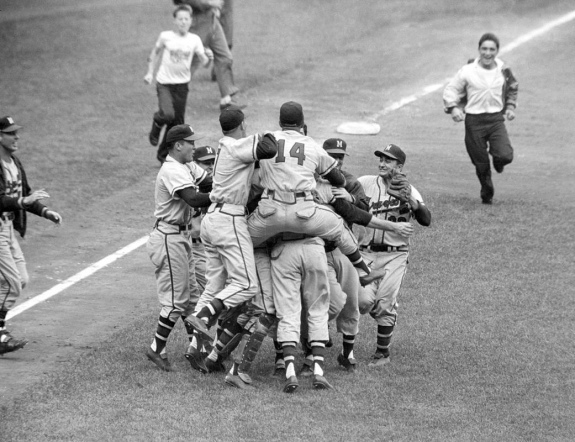 The Milwaukee Braves defeated the New York Yankees, 5-0, during Game Seven of the 1957 World Series at Yankee Stadium. Braves first baseman Frank Torre (14) leaps on winning pitcher Lew Burdette. What a crazy ending to the 2018 regular season. Major League Baseball required an extra day to square away the National League's postseason picture. After 162 games, the Atlanta Braves were the sole division winners in the Senior Circuit. Which team would win the NL West: the Colorado Rockies or Los Angeles Dodgers? How about the NL Central? Would the Milwaukee Brewers continue their winning streak and catch the Chicago Cubs? For the first time in MLB history, two tiebreaker games were necessary to address all of the uncertainty. The American League dabbled with history, too. For the first time in history, three teams won more than 100 regular-season games in the same league. The Boston Red Sox established a new franchise single-season record by emerging victorious 108 times. In the Bronx, the New York Yankees finished second in the AL East (the first Wild Card team) and won 100 games. Over in the AL West, the reigning World Series champions, the Houston Astros won 103 games. Just think, at least two of them will fail to win the pennant. Now the playoff picture is set and 10 teams are ready to claim their league's respective pennant and battle for a World Series title. The Brewers won the NL Central and the Dodgers won their sixth consecutive NL West title. The quest for World Series glory will commence at Wrigley Field on Tuesday night as the Chicago Cubs host the Colorado Rockies. Each year, the World Series has a way of linking generations of baseball fans. For more than 100 years (with the exception of 1904 and 1994), the Fall Classic pitted the National League and American League pennant winners in a best-of-seven (and occasionally a best-of-nine) format to crown the best team in the sport. Looking ahead, this postseason provides many World Series combinations we've seen before. With these 10 teams, there are 27 championship rematches in store. Of course, whenever the Yankees and Dodgers play in the same postseason, that number increases exponentially.